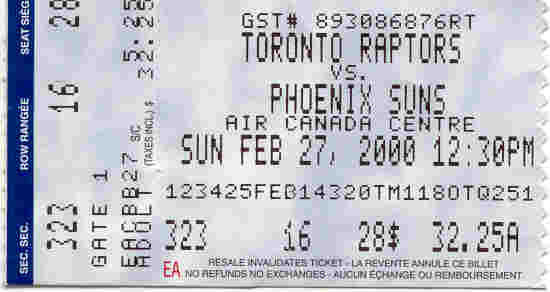 The last time I was at the ACC to see the Raptors face the Phoenix Suns, it was a significant milestone in Toronto Raptor history. It was the first nationally televised game for the Raps, airing on NBC at 12:30 on February 27, 2000. It was also the game Vince Carter scored 51, still a franchise record. Tonight, I'll be watching the Suns and Raps again. I bought the tickets to see the greatest Canadian basketball player in the history of the sport, but I'm still cheering for a Raptor victory. With Bosh out of the lineup, I wonder who will step it up to set a new franchise mark for points? Carlos Delfino, this is your night.